Leviton's Evr-Green Home Charging Stations enable quick charging of any SAE J1772TM Compatible Plug-In Electric Vehicle. These Level 2 Charging Stations are avaialble in multiple charge rates, allowing you to optimize the charging speed of any Electric Vehicle. Multiple moutning options allow for installation in outdoor or indoor applications. The intuitive user interface and automatic features make the charging process extremely simple. The small footprint of these stations requires a minimum amount of valuable wall space for mounting. 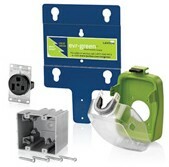 The patent pending mounting system allows for a do-it-yourself installation (when using cord-connected stations in conjunction with the Evr-Green Pre-Wire Kit).